The first photo shows my skinner blend. I've simply laid a bunch of coloured clay onto a pearl/white mix sheet. Both the layers and the sheet are a medium thickness and the sheet is the width of the pasta machine. I didn't do anything in terms of planning the colours other than to make sure that I had stripes in different locations of the colours that I wanted. You can also see that I didn't worry about making nice even triangles or any sort of precision. These colours were bits that I had laying around that weren't enough to do really anything else with. The resultant blend is what I call a skinny skinner blend. Roll the blend up and compress it into a flat plug that's at least as large as your cookie cutter. Don't worry about precision here. I like to start with canes that are about 1-2 inches tall so that's how short my plug is. With cookie cutter canes and complex shapes you really don't want it a lot taller than the cookie cutter since you'll have to continue to push the cutter through the clay. To do it again I would leave more white. Try to get a good mix of light and dark. Now you're ready to start making the flower. I've started the imprint of the cookie cutter which allows me to cut my centre line. Cut the plug in half. This allows you to more easily remove the clay that's on the inside of the cookie cutter. This part can be a bit fiddly. Once the two halves have been cut you can start to add detail to the petals and the centre. I simply sliced the cane into the petal shapes and then took out a bit in the centre. 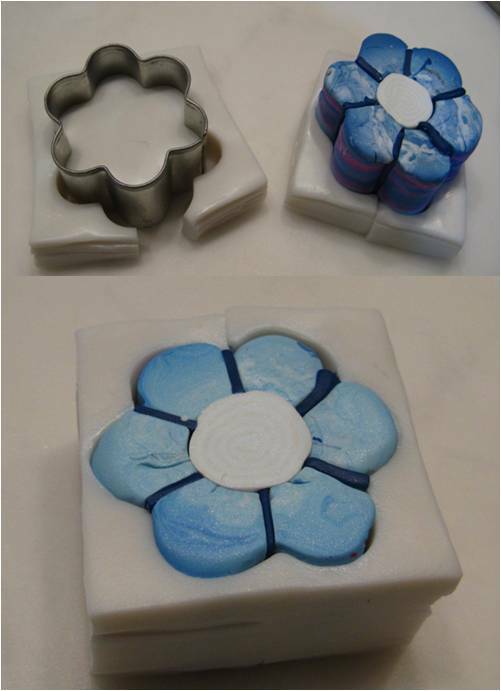 It's easier to remove the centre portion petal by petal. You can see how I've done it in the third set of pictures. After I finished the detail I really wrestled with whether the white centre was too much. I was tempted to start the centre again and add something in the very centre, at least another dot of colour so that there wasn't too much white. But I got lazy and didn't want to do that. I probably should have. Also, if you want, you can flip flop alternating petals to give it more interest. So, petal 1 would show the topside of the cane. Petal 2 would be taken out, flipped and then placed back into the cane. If one end of your plug was blue and the other pink, then petal 2 would be pink on top. Petal 3 would be blue, petal 4 would be pink, etc. I didn't do it in this example because both ends of my cane happened to be blue and you wouldn't have seen the difference. Now it's time for the packing. I'm a lazy packer. I hate packing. So if there's an easier way to do it, I'm in. 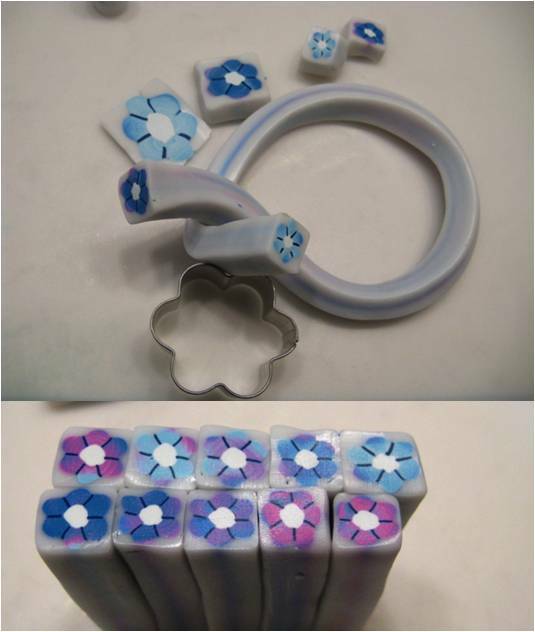 With cookie cutter canes packing is wonderful because you use the outside of the cookie cutter shape. I've used translucent in this example but I could just have easily used white or some other colour. A pale yellow probably would have been nice. Layer your translucent into about four thicknesses thick. Cut it into a squarish shape that's big enough to surround your cane with as much border as you want of translucent. I don't tend to like a lot of border. Press the cookie cutter into the block and remove the outside portion. It's much easier if you cut a notch into the clay (image on the top left) and peel the clay away from the outside edge. Take this peeled portion and wrap it around the flower. This is so much easier when you're wrapping vs trying to fit the flower into the cutout. Repeat the process until the flower is surrounded. Now you're ready to reduce. One of the reasons I like using a square shape for wrapping is that I find reducing squares easier than round shapes. I can keep things in line better. And with translucent if I'm stacking the canes they fit together easier. You can see the final product here with the different variations. I probably have too much dark blue and not enough of the lighter colours. I also really should have put another colour in the very centre just for interest. And the petal separators extend too far out and are too thick. But I'll be able to use the cane in Bottles of Hope and it serves as a general idea for those that are reading. I'm sometimes not quite happy with my canes until I put them onto whatever I'm doing. I suspect it'll be the case with these. It's a bit of a trial and error process. You can also do different shapes - the hearts were a great hit at Morrisburg. Happy faces are just about the easiest thing to create as well. Stars in different colours would also work. A while back I did try it with a maple leaf cutter but the cutter was too detailed and it was too difficult to remove the leaf from the cutter without completely distorting the clay. That one would take more planning. Hope you enjoyed these tutorials.